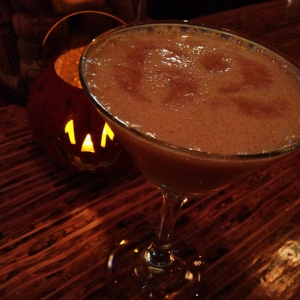 This tasty looking beverage is the “Autumn Harvest” as made by 62 Restaurant in Salem. 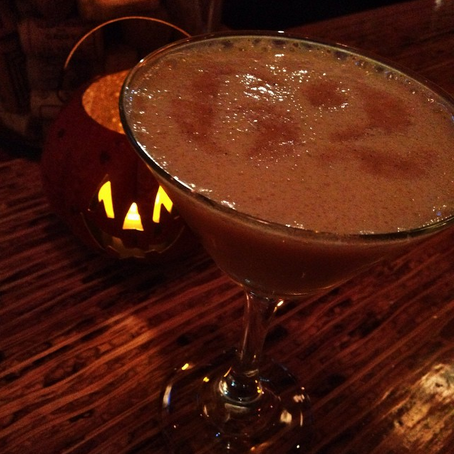 So they obviously know a thing or two about Halloween beverages and other tasty treats. If a trip to Salem isn’t possible, you can learn how to make one at home (along with several other seasonal cocktails) thanks to Nightclub & Bar Magazine Online. Hi-C’s “Ecto Cooler” went off the market in 2007 under the name “Crazy Citrus Cooler,” but that doesn’t mean you can’t drink it anymore. Why? Because Ghostbusters: Chicago Division has figured out a recipe which duplicates both the taste and coloring of this classic drink! The movie Sharktopus vs. Pteracuda has an official cocktail called “Kraken vs. The World.” Other such promotional drinks include “Kong’s Revenge,” “Piranha,” and “Godzilla” (which was apparently made to promote the release of Godzilla vs. The Smog Monster in America). Special thanks to 62 Restaurant for use of the image!